Unlouched, a light yellow-washed green, not quite peridot. Actually a little closer to celadon, with just a hint of bluish influence. Crystal clear, clean, and bright. Louched, “cream of celery” with very nice amber, light rose, yellow, and blue highlights. Just the right weight with just the right translucence to really light things up. Overall a pretty greenish yellow with colorful refractions that augment the beauty. Gorgeous sheen, very pearl-like. And while I no longer make a big deal of “action”, I would be remiss if I didn't comment that the show getting there is about as good as it gets. Unlouched, anise/fennel with high quality herbal notes, and a slightly spicy confectionery tinge. Louched, wormwood, pontica, and hyssop up front with very good support from the balance of the trinity. Picking out the individual components is difficult due to the fine balance. A savory spiciness. Probably the cleanest base of the Jade bottles I've had. As it warms it becomes a little earthier and the hyssop just sings. Texture is the first big impression upon entry. It's firm and round, but clean, smooth, and silky. A really nice balance that only the finest beverages achieve. A very balanced expression of the trinity with just a little push in the spice and mint area, which is restrained until the finish. The anethole sources lend just the right support to the first rate wormwood and only really show their hand after significant sqooshing around the mouth, and on the finish. This is all wrapped by a little lemon and more mint to really tighten the focus. Subtle pull and slight drying followed by a pretty good bloom of spice and a fine tingliness. This segues to soft wormwood, powderiness, and really good length. I could continue to chew on this finish for minutes. Another Jade winner. A very serious style. Nice profile, great texture, hard to fault. An assertive masculine style that doesn't go overboard. This is a local friend's favorite Jade, and it's easy to see why. This review is based on a bottle of September 2007 production that has been open about three years now. My favorite dilution in right in the 4.5:1 area, give or take a little, depending on my mood. When I'm in that mood for something spicy and slightly exotic, this never fails to satisfy. Done with a 1 ounce dose, diluted 4:1, 4.5:1, 5:1 and no sugar. Jade Verte Suisse, 6/25/11, 7/09/11, 2/10/12, 2/11/12, 4/01/12. Color is a deeper green than the Eddy. Very inviting, but after water, looks a bit murky. Louche slowly builds with great oils trails and nice layering. The aroma is almost medicinal, with some wormwood and hints of something that reminds me of... allspice, or maybe nutmeg? The taste is very light a crisp with the noticable presence of top quality anise. It's a bit thin on the tongue though. Overall, another nice addition to the Jade line. Not my favorite of the 4, but still very much worth having on the shelf. This absinthe is distinct from others in the Jade line but not as out in the periphery as Jade NO as it has a much more traditional profile. One aspect which stands out to me is the initial bite present... which then slowly and completely mellows into something much more balanced. It's quite good and the "travelling" aspect of the flavours swinging from this initial sharpness to a delicious calming fullness and back again with another sip is quite an achievement. A wonderful absinthe! Color: Verte Suisse lives up to it's name offering up a light clear and for once a bit more green than yellow color. Still very natural but also a tad light. Louche: This louche is amazingly pretty. Honestly one of the most captivating louches I've seen. Swirls are dancing all around and clouds pop into existence. There is a very nice gradient and a final layering effect that is wonderful. It's almost hard to give anything else a 5 after this. Very good louche. Aroma: Spicy aroma with wormwood as well. Not too heavy on anise or fennel although they are detectable. A well balanced yet spicy and very suisse smell. Flavor: The flavor is smooth and balanced. At first the spice is very direct but it balances out quickly. I'm not usually a suisse style person but this is wonderful. The flavor is closer to licorice than most absinthes that I've tried but it is still very good. This would do well in the winter for a treat. Finish: The finish numbs quickly and hangs around for a good bit. At first it sweetens but then it gives way to a slight bitter numbness that plays well. Overall: This is smooth and spiced. I like this one surprisingly well, especially as I 'm not a suisse style person. The finish is good and the taste is spot on! This also showcases one of the prettiest louches I've yet to see! Color: A very nice green with a slight yellowy paleness. Louche: Wild oil storms and slow layering, turning into oranges and minty green, eventually ending in a very creamy and pale luminescent "minty" white. Beautiful and perfect. Aroma: Neat, this is sweet and spicy. After the louche it fills the room. There's a really lovely and complex overtone of anise, but still maintains it's spiciness and has a good deal of warm wormwood scent. Flavor: Wonderfully balanced, round and smooth, yet still deeply spiced. Finish: Confectioner's sugar and licorice on the finish, nice and lingering and a bit mouth-numbing. Very fresh. Overall: I like this one quite a bit, as far as to say it's excellent. I like the alcohol level of this one, and I really enjoy the slight boozy flavor. I do wish it were slightly more complex. *I revisited this review after a year of many glasses. Served at 4:1 This is where I enjoyed it most. No sugar. Color: Light peridot with a touch of yellow, clear and natural. Louche: Full, slow and evenly forming, nice trails, distinct layering. Opalescent and wonderful to watch. Puffs of smoke roll with each drop reaching up toward the clear layer above. Lovely color, perfect thickness. Aroma: Very herbal and powerful. Wormwood and anise are strong and good quality. It filled the room, and foretold of yumminess. Flavor: Crisp, complex, and a bit of earthiness. Masculine, yet not in the least bit overwhelming. I kept reaching for the glass wondering if I was drinking it too quickly. A strong and delicious wormwood wrapped in anise and fennel, with a nice light pepper and spice. Finish: It built nicely, lingered, then slowly faded. Wormwood, anise, a floral linger, ending in a nice citrus tanginess with a gentle bitterness. Very enjoyable. Overall, A slightly softer personality than PF1901, which I also love. This is something I most certainly would buy again. Color- Clear and inviting green that is edging more towards a straw-like color. A tad light compared to other Jadeâ€™s. No sediment in any of the glasses Iâ€™ve been pouring. Louche- Good billowing oil trails starting at the bottom of my Pontarlier glass. It louches fast but ends with really nice blue refractions when looking at it in natural sunlight. Aroma- Robust and creamy hyssop and fennel. The wormwood pokes out every now and than too and adds a great layer of complexity. Everything intertwines perfectly. Flavor- Wormwood first and foremost. It lends a heavy but appropriate earthy/green bite. Candy-like anise towards the back of the throat is nice. The mouth feel may be just a tad too thin. Finish- The wormwood starts off and eventually dies down to anise and reminds me of confectioners sugar. The anise stays for a while. Overall- Extremely well crafted absinthe. 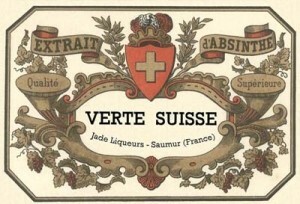 Verte Suisse is really multi-faceted. A glass without sugar really brings out the complexities of the wormwood but when some sugar is used other herbs are brought out and the mouth feel is much more robust. Iâ€™d like to compare this to the original Berger pre-ban!